Henry Overholser constructed the Mansion. Henry Overholser was referred to as the Father of Oklahoma City. The mansion was built in 1903 and is the considered the first ever built mansion in Oklahoma City. The home used to be a center of social life such as hosting of events, dinners and wedding ceremonies. The mansion's property that includes fixtures canvas painted walls and furnishings are still available. These fixtures, canvas-painted walls, stained glasses, and furnishings provide visitors with a unique experience as they see the mansion the way the Overholser family saw it. The daughter of Henry Overholser was born in the mansion in 1905. She was their only daughter, Henry Ione. Henry's wife was called Anna. Henry died in 1915 and his wife Anna together with their daughter Henry Ione continued to live in the house. Anna later died in 1940 and the house was passed on to Henry Ione and her husband David Jay Perry. They had no children. Henry Ione died in 1959 and her husband was left as the heir of the mansion. The US Senator, Mike Monroney resided in the mansion on an official term from 1956 to 1968. David Perry sold the land to the Oklahoma historical society realizing its historical value. David succeeded in selling the house and the mansion was preserved by the Oklahoma historical society. He stated that it was the wish of Henry Overholser's wife for the house to be sold and preserved by Oklahoma City. Perry wanted it to be preserved as a living memory of the people who came to Oklahoma during the year of the Oklahoma Land Run in 1889. In 1972, Henry's mansion was officially on the National Register of Historic Places. 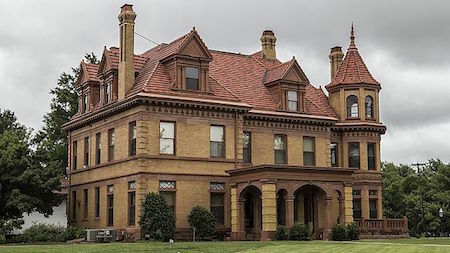 Henry Overholser mansion is now owned by the Oklahoma historical society and managed by the Preservation of Oklahoma. The Preservation of Oklahoma is a private nonprofit organization that Oklahoma's historical places. The mansion reflects on Oklahoma City's beginning and the people who were brave and hardworking to preserve Oklahoma City's legacy. These people dedicate themselves to hardwork and without them, the pieces of land that preserve Oklahoma's history could be completely lost. The mansion served as a place for receptions, births, deaths and hosting of weddings. The mansion tours are guided and it is usually open from Tuesday to Saturday. The tours are given at 10am, 11am, 12 noon, 1pm and 2pm. Each tour lasts for around 35-45 minutes. There are admission rates for the mansion. For adults, a fee of $10 is charged, $7 for seniors (55years and above), $5 for students or children and for the children under the age of 6 years no fee is charged. Parking space is available in front of the mansion on the Northwest 15th Street of Oklahoma City. For group tours of more than ten people, reservations are required before visiting the mansion. Visiting Oklahoma City for a while? There are lots of fun things to do. Check out the Science Museum. For more activities check out our homepage.